"Vilmart & Cie. traces its history back to 1890, when it was founded by Désiré Vilmart, and from the beginning, Vilmart & Cie. has always been a récoltant-manipulant, making champagne exclusively from estate-owned vines. 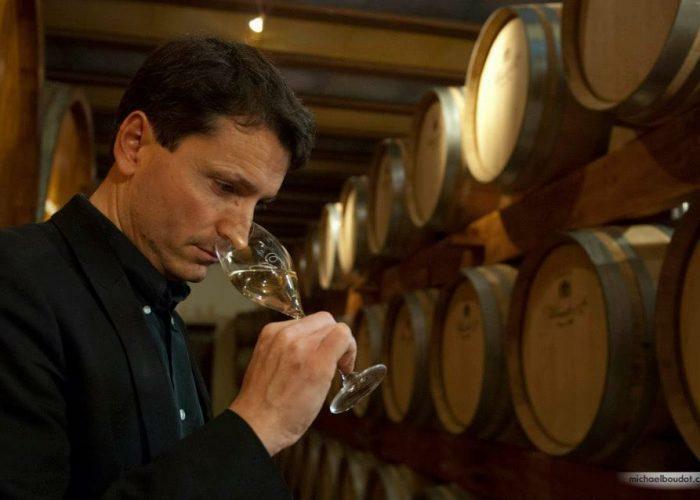 Since 1989 the estate has been in the hands of Laurent Champs, the fifth generation of the family to take the helm of the house. The majority of Vilmart's 11 hectares of vines lie in Rilly-la-Montagne, although there are a few plots just over the border in the neighboring village of Villers-Allerand. Vilmart is a member of Ampelos, an organization that promotes organic and sustainable viticulture, and Champs has never used any herbicides or chemical fertilizers since taking over the estate. All of the vineyards are planted with cover crops and plowed, and Champs enjoys an additional advantage in that his parcels are relatively large--only 12 different parcels over 11 hectares--meaning that he is more protected from contamination by chemical treatments in neighboring plots. Vilmart & Cie. is not only one of the greatest grower-estates in Champagne, but one of the finest champagne producers of any type in the region." In the early days when I first approached Vilmart and started working with Laurent Champs, I had mixed emotions about some of the Champagnes. Please note what "mixed emotions" actually means. It doesn't mean I doubted the worthiness of the wines or thought they were mediocre. It means I had different opinions about different aspects of the wines. I was thrilled with some, intrigued with all, and wondered whether a couple were too oaky. Earlier in his career, I think Laurent was flying blind on the matter of oak, and his recent Champagnes have wisely--presented a more integrated and elegant profile. Yet he is adamantly a vintner first, before he is a maker of Champagne: "We do wine first, then afterward we do Champagne," he says. Every base wine, without exception, sees at least ten months in casks of varying size and newness. Once in a while there's a brief disconnect between fruit and wood immediately after disgorgement, but 2-3 years on the cork make for a dramatic metamorphosis. Matter of fact, I've found Vilmart among the most food-friendly of all my Champagnes, because they're so gracious, so vinous, so lordly in their carriage. It's clear to me Vilmart is a Champagne estate of unassailable consequence, a must-have for anyone Interested in the possibilities of this most suavely powerful and graceful of all wines. Casks are hardly the point anymore. Organic viticulture, (truly!) low yields, remarkable polish of fruit, and the deliberate patient pursuit of a vision of perfection make Laurent Champs' estate a gemstone gleaming among the chalk.